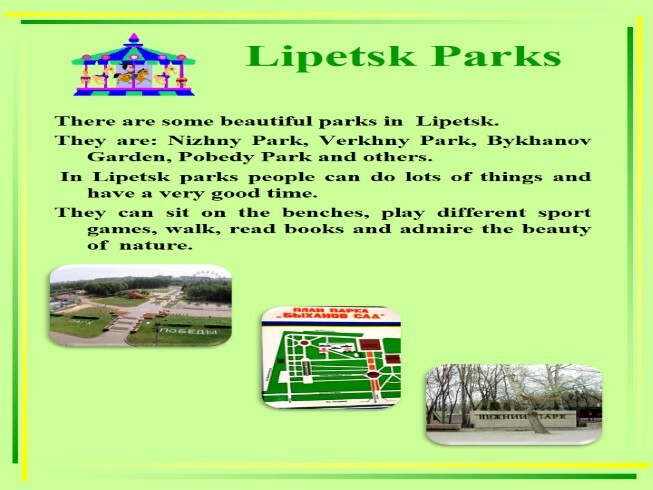 Lipetsk was first mentioned in the 13th century chronicles It was founded in 1703. It is situated at the distance of 508 km from Moscow in the western part of the Oka-Don plain, on the banks of the river Voronezh. In 1703 by instructions of Peter I construction of ironworks was started on the river Lipovka (a tributary of the river Voronezh). In 1709 the settlement near these plants was named a village Lipetskiye Zavody. In 1779 the large village was reorganized into the district city of Lipetsk of the Tambov province. In 1803 thanks to local mineral springs with mineral water here appeared a resort which is considered to be one of the oldest in today's Russia. 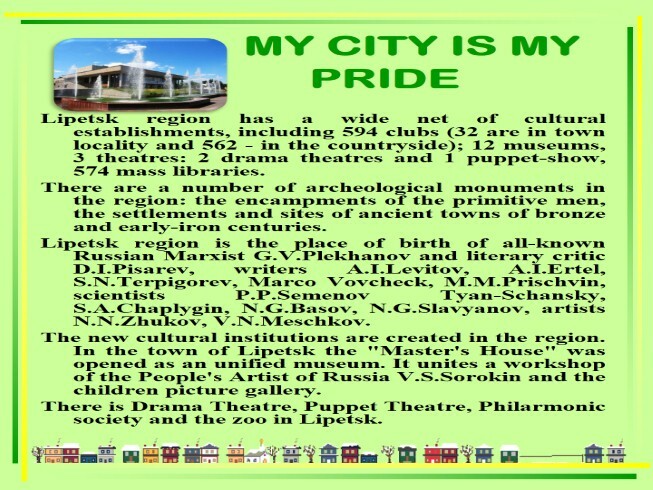 Lipetsk region has a wide net of cultural establishments, including 594 clubs (32 are in town locality and 562 - in the countryside); 12 museums, 3 theatres: 2 drama theatres and 1 puppet-show, 574 mass libraries. There are a number of archeological monuments in the region: the encampments of the primitive men, the settlements and sites of ancient towns of bronze and early-iron centuries. Lipetsk region is the place of birth of all-known Russian Marxist G.V.Plekhanov and literary critic D.I.Pisarev, writers A.I.Levitov, A.I.Ertel, S.N.Terpigorev, Marco Vovcheck, M.M.Prischvin, scientists P.P.Semenov Tyan-Schansky, S.A.Chaplygin, N.G.Basov, N.G.Slavyanov, artists N.N.Zhukov, V.N.Meschkov. The new cultural institutions are created in the region. In the town of Lipetsk the "Master's House" was opened as an unified museum. It unites a workshop of the People's Artist of Russia V.S.Sorokin and the children picture gallery. 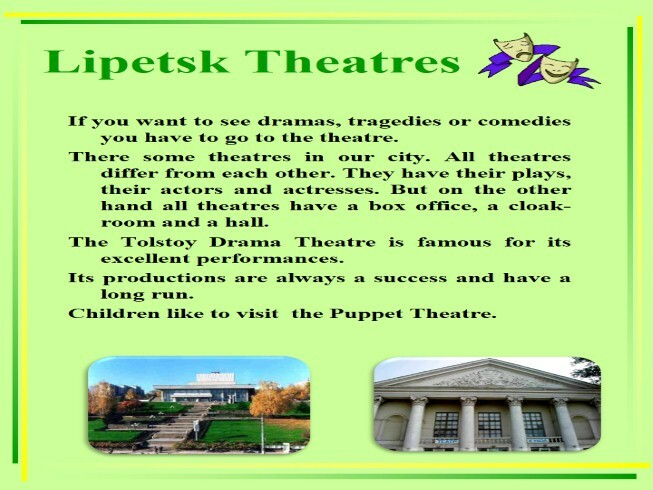 There is Drama Theatre, Puppet Theatre, Philarmonic society and the zoo in Lipetsk. There are some beautiful parks in Lipetsk. 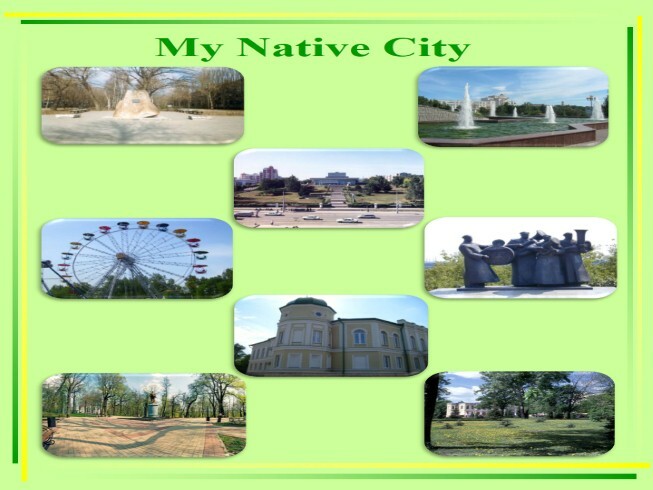 They are: Nizhny Park, Verkhny Park, Bykhanov Garden, Pobedy Park and others. In Lipetsk parks people can do lots of things and have a very good time. They can sit on the benches, play different sport games, walk, read books and admire the beauty of nature. Area:13.8 ha Verkhny Park is a park in the Right Bank district of Lipetsk. It was founded in 1911 at the top of the hill of the valley of the river Voronezh, between Lenin Street and Saltykov-Shchedrin street. There are different kinds of trees there such as ancient oaks, lindens and maples. In the middle of the 20th century there were merchant houses there. Nowadays we can see the most attractive buildings, the Chemist’s House and Wedding Palace. At the end of the 1950es the park was renamed. It became Children's Park. In 1957 the cinema "Zarya“ was built there. In 1970 the monument to Lenin appeared in the park and at the same time the park received a new name - Pioneer Park. On the 19th of May, 1972 the monument to Pioneers Heroes appeared for the 50-th anniversary of the Pioneer organization. In 1987 the sculpture of "The International - the guys musicians“ was created in the Verkhny Park. On the 1st of June, 2006 Children Park was called Verkhny Park again. Some years ago a new area for little children was opened. There are many attractions for them. It is called “Skazka”. Area:13.8 ha Bykhanov Sad is a park in the Right Bank district of Lipetsk. Bykhanov Sad was founded in the XVIII century by brothers Vaciliy and Evgraf Bykhanov. They were gardeners and honorable citizens of the town. There are different kinds of trees there, such as birches, chestnuts, pines, firs, apple-trees and many others. In 1954 the park was renovated and renamed in Komsomolsky Park. In 1967 the monument to V. Skorokhodov was opened there and the park became Skorokhodov Park. 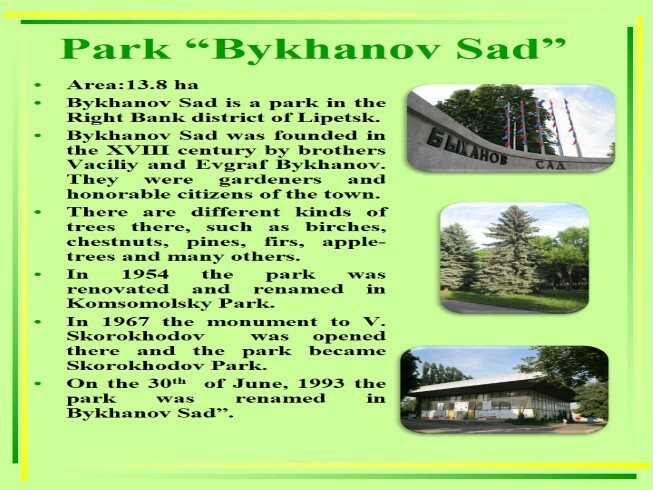 On the 30th of June, 1993 the park was renamed in Bykhanov Sad”. 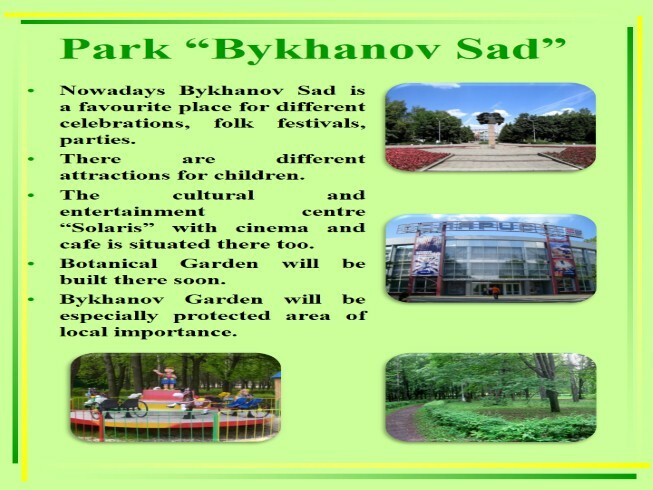 Nowadays Bykhanov Sad is a favourite place for different celebrations, folk festivals, parties. There are different attractions for children. The cultural and entertainment centre “Solaris” with cinema and cafe is situated there too. Botanical Garden will be built there soon. Bykhanov Garden will be especially protected area of local importance. Area:101 ha Nyzhny Park is a park in the Right Bank district of Lipetsk. 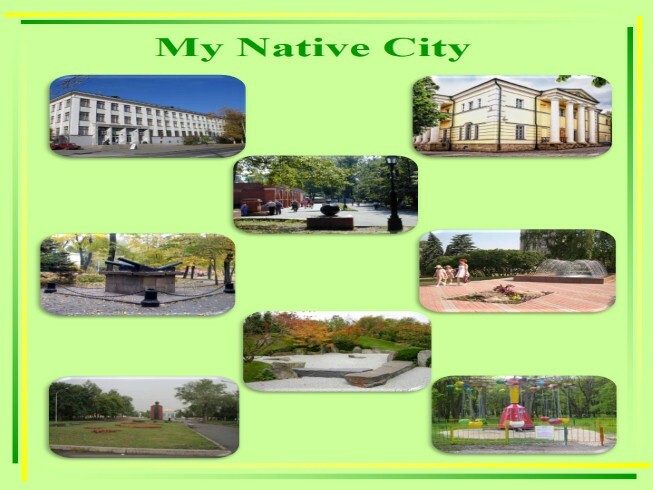 It is the largest and the most popular park in our city. The park has over 50 species of trees. There are a lot ancient oaks and lindens. Peter Pond was situated on its territory in the 18th century. It was the largest man-made pond in Russia. On the 25th of April, 1805 Alexander I signed the decree to open the resort “Lipetsk Mineral Water”. Soon they planted many trees for the new park. Landscaping of the park continued throughout the 19th century. 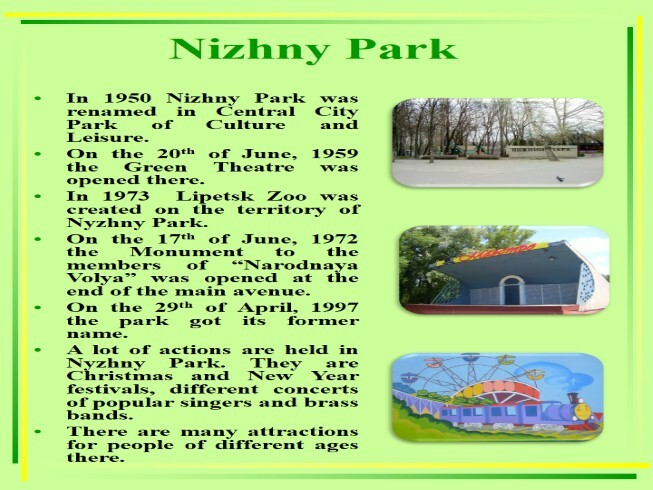 In 1950 Nizhny Park was renamed in Central City Park of Culture and Leisure. On the 20th of June, 1959 the Green Theatre was opened there. 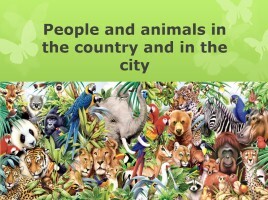 In 1973 Lipetsk Zoo was created on the territory of Nyzhny Park. On the 17th of June, 1972 the Monument to the members of “Narodnaya Volya” was opened at the end of the main avenue. On the 29th of April, 1997 the park got its former name. A lot of actions are held in Nyzhny Park. They are Christmas and New Year festivals, different concerts of popular singers and brass bands. 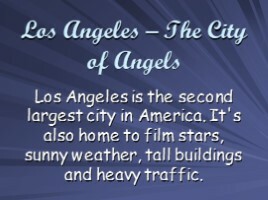 There are many attractions for people of different ages there. 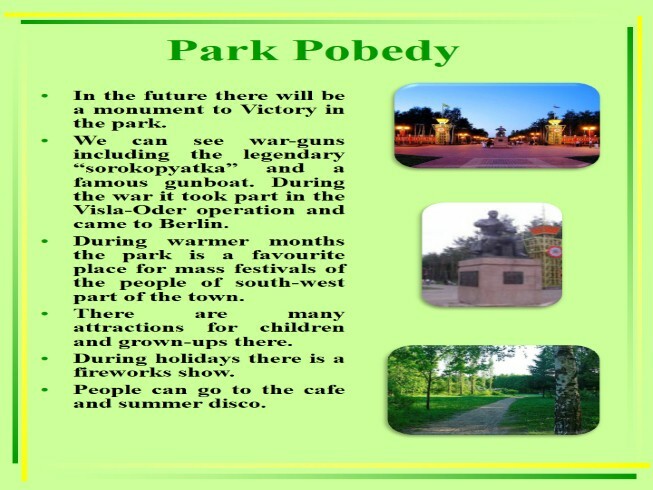 Area:35 ha Park Podedy is a park in the October district of Lipetsk. The park has over 40 species of trees. There are a lot of pines, birches and maples there. It was founded in 1973. In spring, 1988 the first attractions were installed there. In spring, 1994 artists first came on the summer stage. In 1995 the museum of Military Equipment was opened under the open sky. It consisted of ten units. To the 60th anniversary of the Victory the sculpture of a warrior-liberator was put there. In the future there will be a monument to Victory in the park. We can see war-guns including the legendary “sorokopyatka” and a famous gunboat. During the war it took part in the Visla-Oder operation and came to Berlin. During warmer months the park is a favourite place for mass festivals of the people of south-west part of the town. There are many attractions for children and grown-ups there. During holidays there is a fireworks show. People can go to the cafe and summer disco. 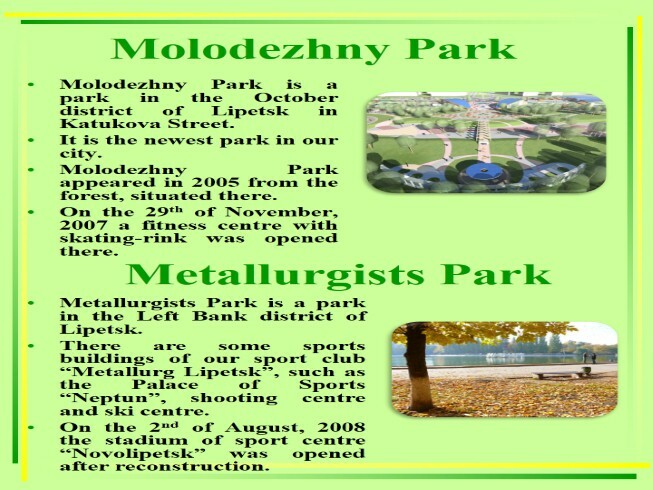 Molodezhny Park is a park in the October district of Lipetsk in Katukova Street. It is the newest park in our city. Molodezhny Park appeared in 2005 from the forest, situated there. On the 29th of November, 2007 a fitness centre with skating-rink was opened there. Metallurgists Park is a park in the Left Bank district of Lipetsk. There are some sports buildings of our sport club “Metallurg Lipetsk”, such as the Palace of Sports “Neptun”, shooting centre and ski centre. On the 2nd of August, 2008 the stadium of sport centre “Novolipetsk” was opened after reconstruction. 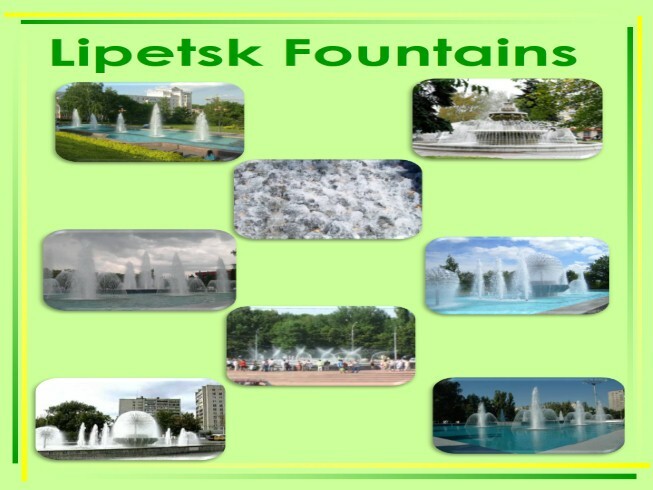 There are many fountains in Lipetsk. 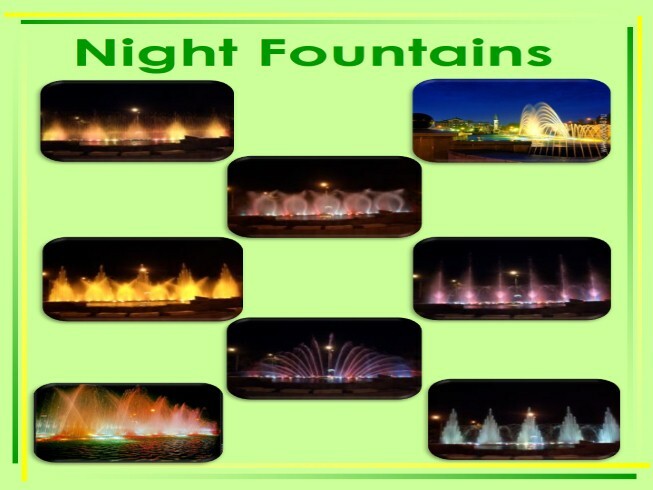 One of them is a colour-sound fountain which is situated in Peter the Great Square near the cinema “October”. It is one of the most up-to-date fountains in Europe. This fountain offers two working conditions: day-to-day work and color-sound work of the fountain. 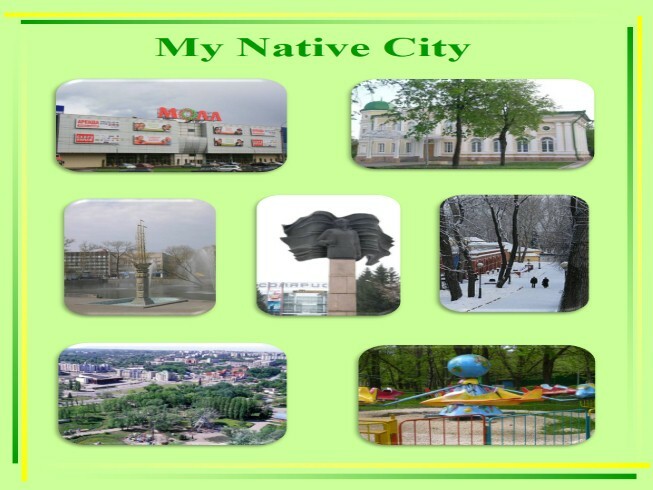 Also it is one of the favourite places for the rest in Lipetsk. A lot of people from different cities come to Lipetsk to see this beautiful construction. Who among us does not like to enjoy a game of water in the fountains, even the most simple ones? No wonder they say that water has a fascinating value, it purifies the soul from anger and envy. In Lipetsk, situated on both banks of the Voronezh River, it's her property is used for all one hundred percent. We shouldn’t forget that our city is among the most comfortable cities of the country. 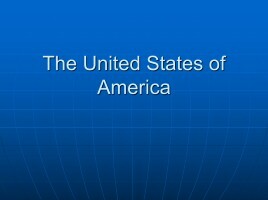 In addition, it has a gimmick, which is no longer anywhere in the Central Federal District. 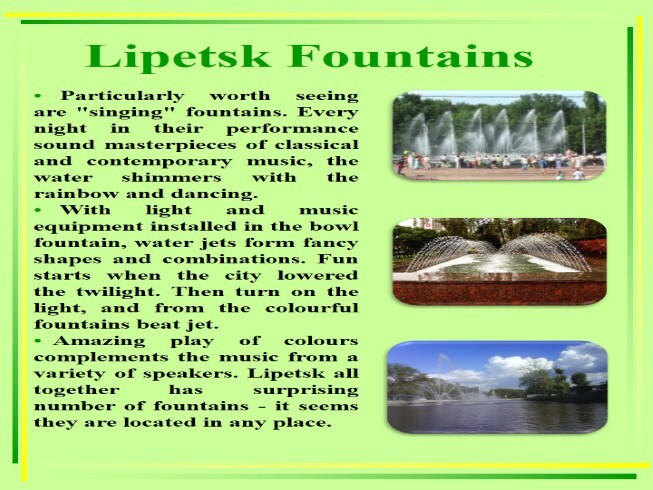 This musical fountains on the square of Peter the Great - the pride of the inhabitants of Lipetsk and wonder for many tourists. Especially in the evening and at night, when beautiful show is carried out. 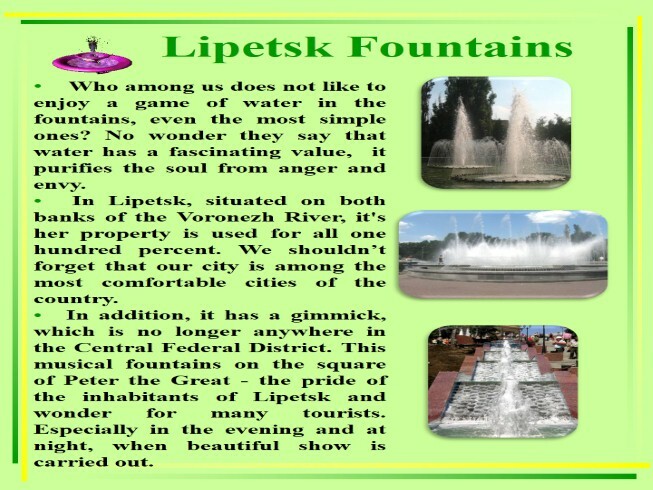 Lipetsk fountains is the construction of the ideal timing of water and light effects. And the music. The three joined together elements fascinate visitors breathtaking show like no other representation. 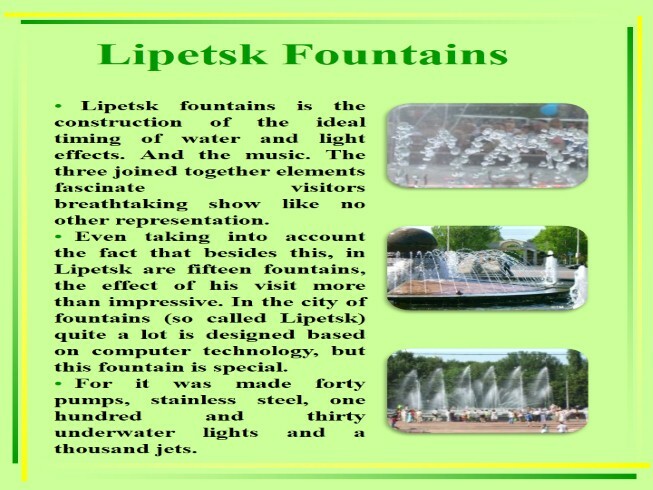 Even taking into account the fact that besides this, in Lipetsk are fifteen fountains, the effect of his visit more than impressive. In the city of fountains (so called Lipetsk) quite a lot is designed based on computer technology, but this fountain is special. For it was made forty pumps, stainless steel, one hundred and thirty underwater lights and a thousand jets. Especially crowded with musical fountain at dusk Lipetsk. Often the area around it turns into a huge dance floor, which, of course, like the local youth and visitors who begin to feel full participants in the show. Local leaders are extremely proud of this fountain. They say that it is no different from what was built in Barcelona. Well, maybe a little smaller would be. But the score of the dynamics of the jets and light the high-quality music in the Lipetsk fountain creates a delicate dance. And the choreographer, according to townspeople, no less talented than in Barcelona. 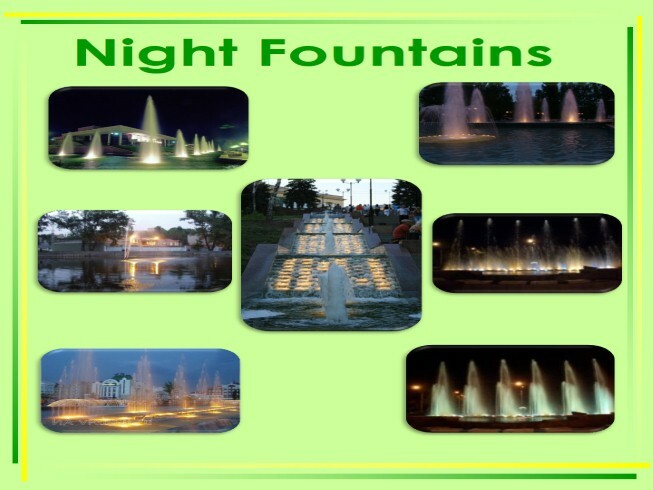 Particularly worth seeing are "singing" fountains. Every night in their performance sound masterpieces of classical and contemporary music, the water shimmers with the rainbow and dancing. With light and music equipment installed in the bowl fountain, water jets form fancy shapes and combinations. Fun starts when the city lowered the twilight. 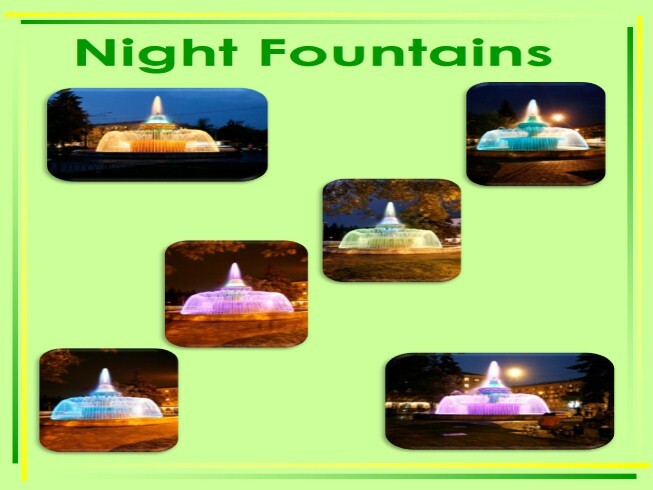 Then turn on the light, and from the colourful fountains beat jet. Amazing play of colours complements the music from a variety of speakers. 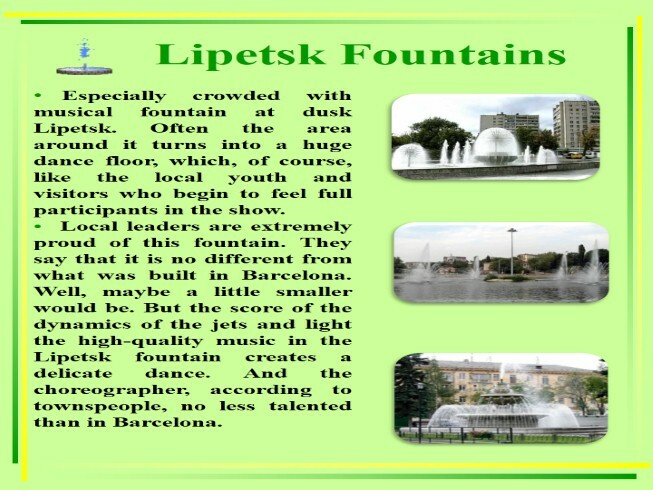 Lipetsk all together has surprising number of fountains - it seems they are located in any place. If you want to see dramas, tragedies or comedies you have to go to the theatre. There some theatres in our city. All theatres differ from each other. They have their plays, their actors and actresses. But on the other hand all theatres have a box office, a cloak-room and a hall. 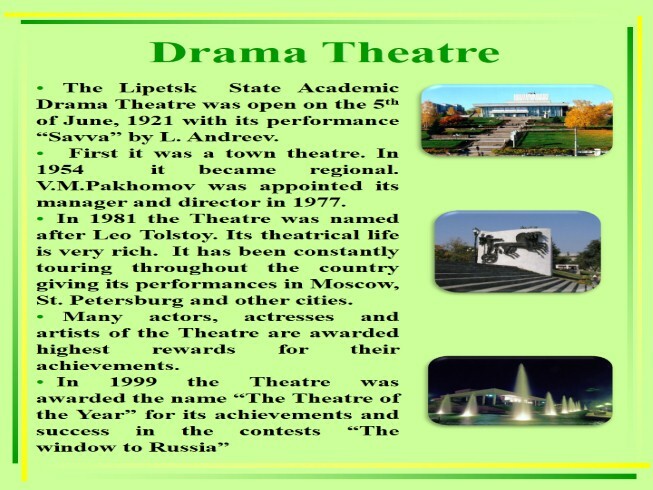 The Tolstoy Drama Theatre is famous for its excellent performances. Its productions are always a success and have a long run. Children like to visit the Puppet Theatre. 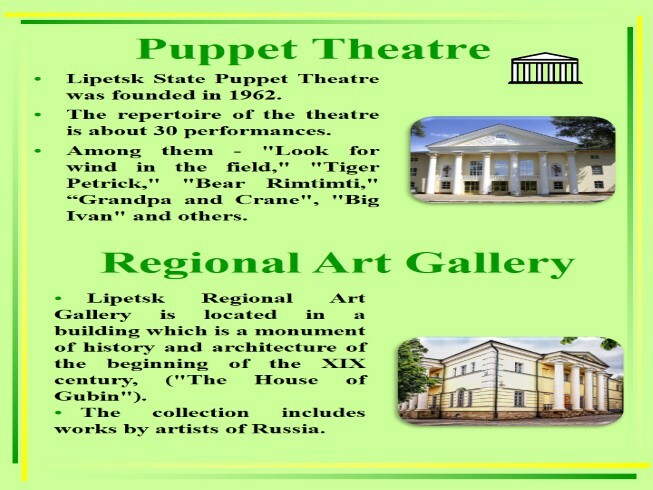 Lipetsk State Puppet Theatre was founded in 1962. The repertoire of the theatre is about 30 performances. Among them - "Look for wind in the field," "Tiger Petrick," "Bear Rimtimti," “Grandpa and Crane", "Big Ivan" and others. Lipetsk Regional Art Gallery is located in a building which is a monument of history and architecture of the beginning of the XIX century, ("The House of Gubin"). The collection includes works by artists of Russia. 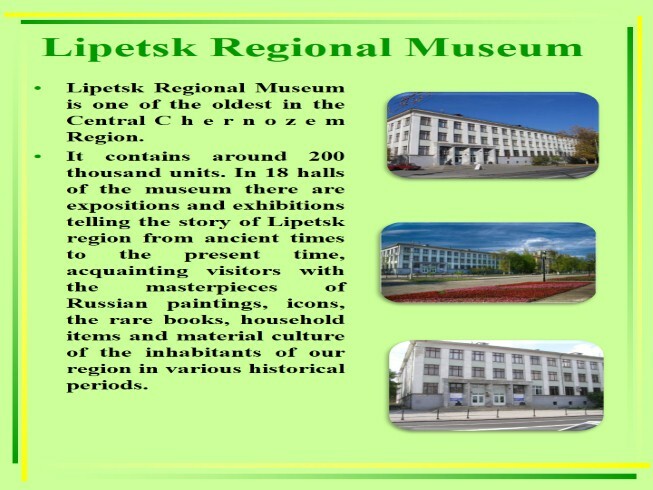 Lipetsk Regional Museum is one of the oldest in the Central C h e r n o z e m Region. It contains around 200 thousand units. In 18 halls of the museum there are expositions and exhibitions telling the story of Lipetsk region from ancient times to the present time, acquainting visitors with the masterpieces of Russian paintings, icons, the rare books, household items and material culture of the inhabitants of our region in various historical periods.